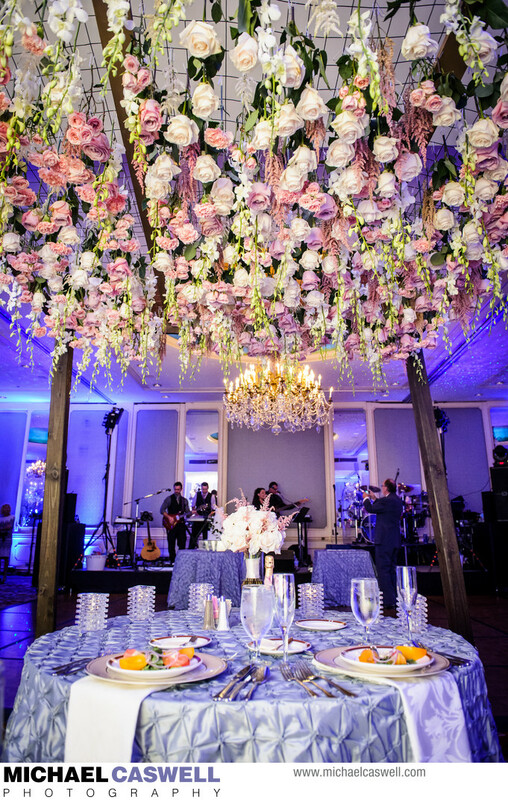 The amazing and talented New Orleans wedding florists at Fat Cat Flowers did the beautiful decorations for this reception in the main ballroom of the Omni Royal Orleans Hotel in the French Quarter. 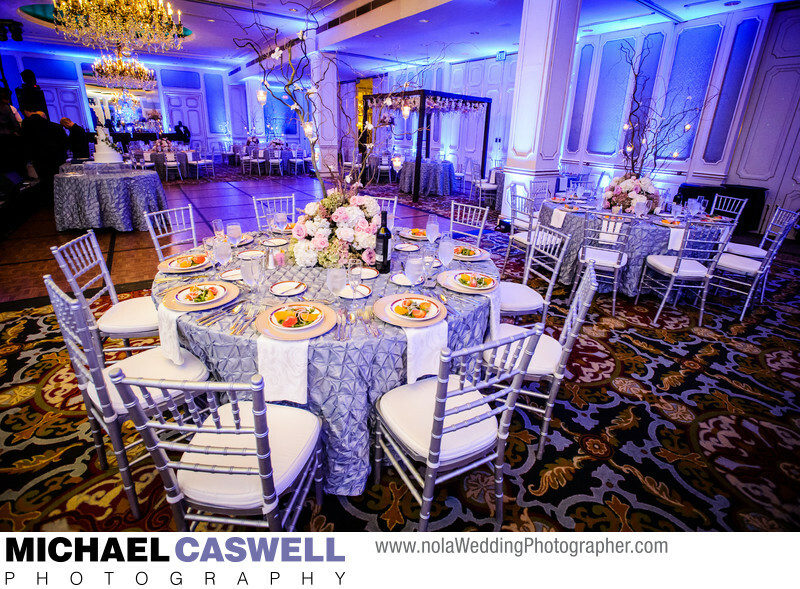 The entire ballroom was gorgeously decorated, with soft blue uplighting along the walls providing a particularly impressive and elegant ambiance that photographed very well. Each table featured an exquisite centerpiece consisting of a floral arrangement along with candles hanging from branches. The head table for the bride and groom, visible in the background of this picture, had a gorgeous canopy of flowers hanging overhead, and looked absolutely amazing. While the majority of wedding receptions in New Orleans tend to feature buffet style meals, this was a formal seated dinner, as evidenced by the place settings. The couple's ceremony had taken place at The Elms Mansion on St. Charles Avenue, and was beautifully adorned with floral decorations by Fat Cat's artisans as well. After the ceremony, a group of chartered streetcars transported everyone to Canal Street in true Crescent City fashion, where they then headed through the French Quarter to the hotel on foot. This truly spectacular nuptial event was coordinated by the skilled and experienced Unique Weddings in New Orleans team, who are always great to work with.